Welcome to this week's challenge at Christmas Card Challenges. This week we have everybody's favorite challenge - Anything Goes!! I pulled out one of my favorite stamps. It's called Hanging Christmas Ornaments by Hero Arts. I used some papers by My Minds Eye and colored the ornaments with Copics based on colors in the striped background paper. The vertical sentiment is from Impression Obsession. Sometimes it's just handy to have a vertical sentiment. I can't wait to see what everyone makes this week! Thanks for stopping by! Oh Donna I just love this card it is so bright and cheerful I love that you used colors that are unconventional from the usual red and green and your coloring is wonderful! 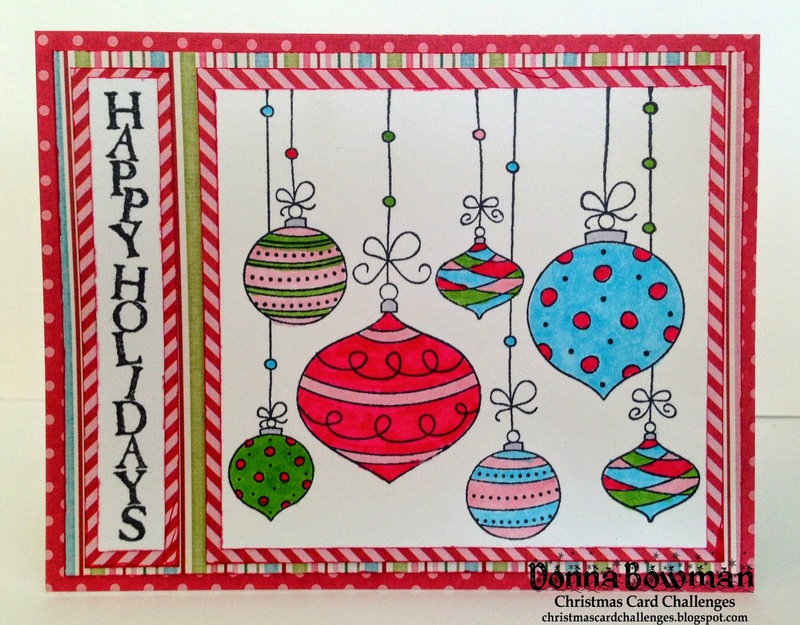 Such a fun Christmas card Donna, love those patterned papers! Love your ornaments Donna! And I especially love that vertical sentiment! You don't see many of those and they do come in handy! Very pretty card! Great Christmas card! It is never too early to start making Christmas cards! love that stamp! and very pretty card. teal and red are the best holiday colors!